Asthe eagerly awaited Apple iPad 2enters therealms of reality ahead of its March 25th UK release, attention now turns to the upcoming iPhone 5 and its likely use of the A5 dual-core processor currently found residing in the second-gen tablet. With the ARM A5 dual-core processor chip rumoured to be heading to the iPhone 5 in June or July, The Economic Daily News, a Chinese publication responsible for numerous Apple leaks, has declared, in a broken English translation courtesy of Makotakara that:"There is no doubt [the iPhone 5 is] to be implemented [with the] multi-processor A5 in iPad2." Set to offer twice the CPU as the original iPad and nine times the graphical power, the A5 is to replace the A4 which currently resides in both the first-gen Apple iPad and the current Apple blower, the hugely popular iPhone 4. Whilst the mooted iPhone 5 has already been rumoured to host a new, slimmer form factor and NFC wireless payment technologies, the inclusion of the A5 dual-core processor would see the Apple branded handset line-up against the new fleet of dual-core smartphones that kicked off with the LG Optimus 2X and has since been joined by the hugely impressive Samsung Galaxy S II. 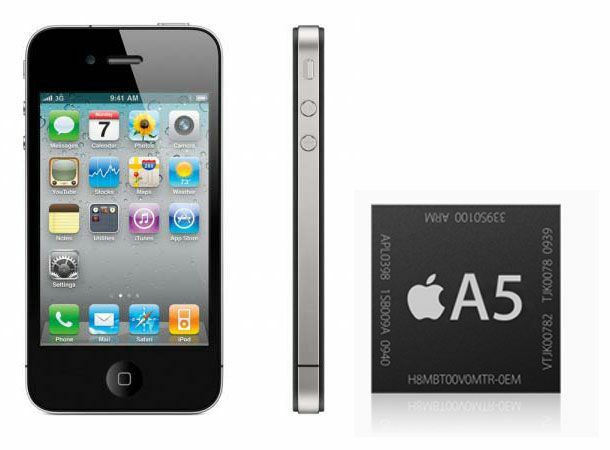 As with virtually all things Apple, the iPhone 5 inclusion of the A5 dual-core processor is still just speculation and rumour. Stay tuned to T3.com and the T3 Twitter and Facebook feeds for all the latest on the Apple iPhone 5 and exclusive analysts' opinions on the handsets potential A5 inclusion. Until then take a look at the A5 processor in use in our hands-on video review of the iPad 2.